Here are my runners after the weekend's bit of work. Lousy photo, the back horse is a bit washed out from the lamps but you get the idea, I'm sure. 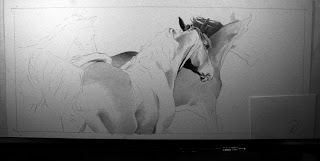 Close to finishing up on this one as I am up against a deadline that just hit and have another horse work to get done this coming week, actually, before the end of this coming week if possible. Midnight oil burning yet to come? One horse complete, second horse just about there, third horse needs a tail, some mane, a neck a head ..... well, I'm getting there! Where things stand so far as I sit down to the drawing board today. 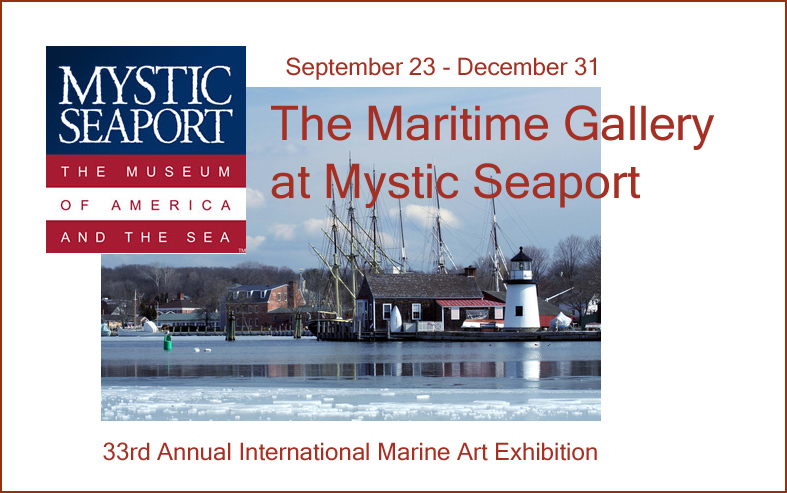 Opening this weekend and running through the end of this year, the 33rd International Marine Art Exhibition at the Maritime Gallery at Mystic Seaport will show jury selected works by internationally reputed artists from across the globe and includes one of my recent works. 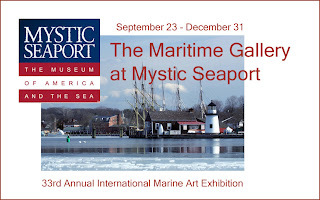 The Seaport Museum is a wonderful and historic destination and if you are traveling through the coastal region of Connecticut this fall, plan a stop to enjoy the boats, buildings and some fabulous art! With the opening weekend festivities of Birds in Art more than a week ago, and having taken somewhat of a break from studio work this past week or so, it is time to get back to 'the grind' as fall shows are looming in the near distance. So, with that in mind, I've begun work today on the first of a dozen or so new pieces for October and November events. Horses are going to play a rather dominant role in the next couple of works, this one being a rather large (for me!) work at 9.5" x 22.5". Sitting in my kitchen this morning, watching some birds in the backyard and musing to myself about where I was just a week ago . 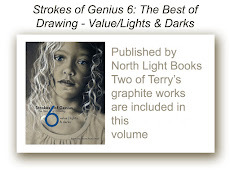 . . at the opening events of this year's edition of Birds in Art, I knew that today would be the day to review my personal picks for favorite works from the outstanding collection that is the 2012 exhibition. As I have said before in previous years of doing this follow up to the opening weekend festivities, I could easily talk about every single work of the 125 in the show but I will try and restrain myself by zeroing in on about one fifth of the works. Throwing a spotlight upon works that I think represent the overall incredible beauty, inventiveness and uniquely personal approaches of all the artists that the jury selected this year, I will begin by mentioning some of my favorite three dimensional works, which I don't believe I have done before. 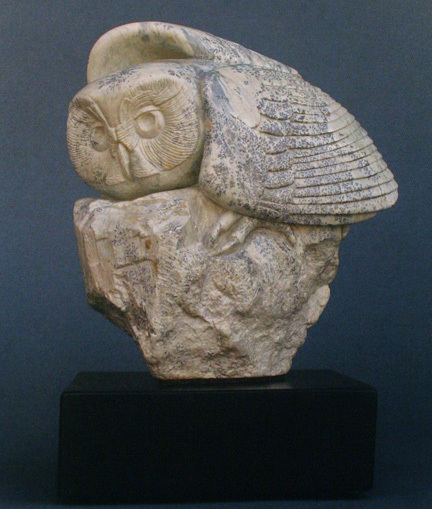 First is a carving, 'In The Moment', by Wisconsin sculptor, Clarence Cameron. The delightfully rendered owl is enhanced by the blue dapples of the Montana Dendrite Soapstone. I have always enjoyed the semi-abstracted nature of Clarence's works and the pose of this little creature really captured my attention upon walking into the main gallery just a week ago. 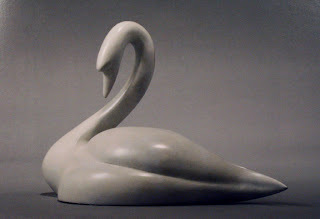 Noted British sculptor, Simon Gudgeon also captured my immediate attention with his 'Swan', again showing a strong move toward abstraction which Simon himself acknowledged in his description of the work and his being influenced by the works of Henry Moore. The alabaster white patina on his bronze was the perfect finish to this marvelously sensuous work. 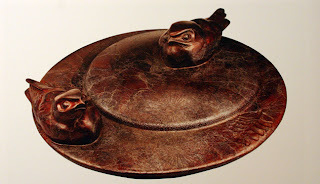 Steve Kestrel's 'A Map of the Nightjar's Heart' once again made me stop and reflect on the clean, spare form of the work set off by the noodly incising and rich patina; yet another interpretive and abstracted three dimensional piece that I would cherish if it were mine. 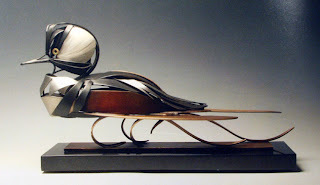 This next stunning combination of bronze and stainless steel by another Wisconsin artist, Don Rambadt, 'Glide', was a particular favorite of mine in that it did just what Don always talks about trying to allow to happen in his work . . . a moment of serendipity at finding humor, grace and solitude all at once in this unique melding of materials. 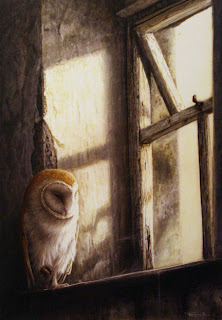 The final three dimensional work in this group of five favorites, above, 'The Nest' by Canadian, Eric Tardif, was definitely, to my eye, one of the most inspirational works of the exhibition. 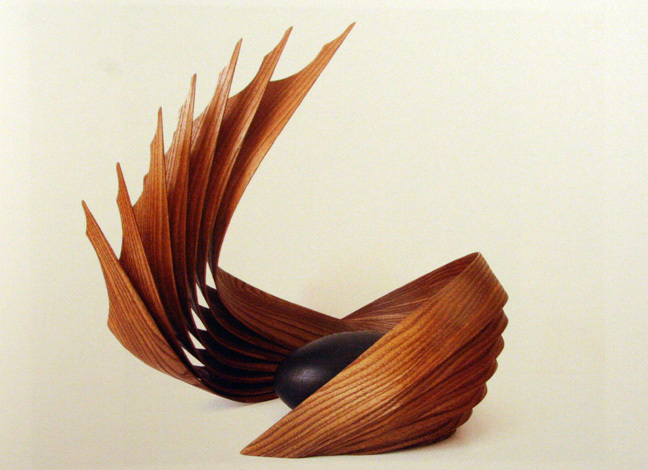 Eric spoke of his desire to capture varying evocations of birds and flight and the expression of movement and I felt he hit the mark with this beautiful work in steam-bent Red Elm. 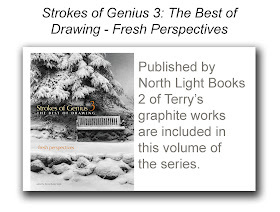 One might think, knowing that my own work is so representational and rather precise in delineation, that I would naturally be drawn to the more realistic depictions in sculpture and I certainly did have favored three dimensional works that were more representational, but I have always been drawn to the 'abstract' and expressive in art (I've spoken about how I try to introduce abstract qualities into my own works on occasion) and these five works truly struck a chord within me. And now to the dozen and a half two dimensional works that also struck deep chords within me. First is a lovely little work by Californian, Barbara Banthien. 'Scrabble' speaks strongly of what I have often said are some of the elements that I feel a jury might be looking for when reviewing works for selection to an exhibition, those being . . . a sense of humor about the work; a unique vision of the subject matter; a striking portrayal of the subject; a strong sense of composition; either high contrast or subtle distinction in overall feel to the work. 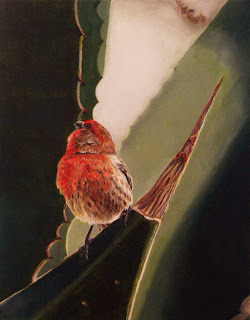 By combining not only the visual text of the subject matter, but also her pert painting of the bird and the intensity of the graphic negative space of the background, Banthien has, in my view, created a very pleasing, expressive, captivating work of art that any jury would be delighted with. Obviously the Birds in Art jury was! In this next work. 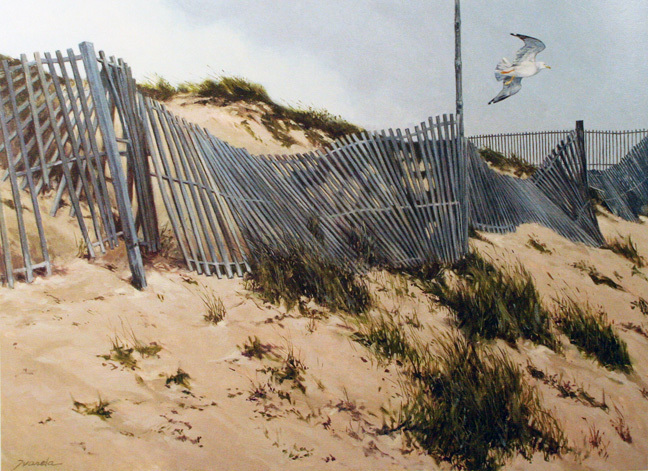 above, 'Unruffled', by Master Artist honoree of 2005, Nancy Howe, I relish the use of yet another of my personally favored ideas about creating an appealing work of art, that being building an interesting composition around multiple subjects. Had this work not been a part of an exhibition entitled 'Birds in Art', it certainly would rate highly as a glorious portrait work. 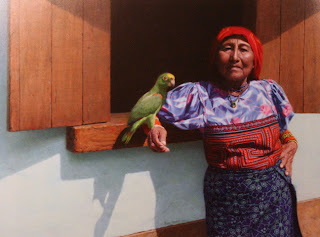 Yet the bird, who sits squarely on the center line of the image field, certainly commands our attention even considering the intensity of the gaze of the woman dressed in lively colors, which in a lesser well-balanced compositional idea might have failed. The softness and subtle colors of the wall and window act as the perfect negative background to the details of the major subjects. Above, in Jeremy Paul's 'Window Light', another window plays a part in the arrangement of the compositional elements of the work but in this case, it has a more dominant role in acting to help direct the viewer's eye into and around the work. A small painting at only slightly more than 16" x 12", it still possesses, even with the spare pallet and monochromatic overall tonality of the work, an equal intensity to that of Howe's work which is more than twice the size, because of the stronger light/dark contrast. It is, in every way, a composition that spoke to me personally and obviously did to the juror's eyes as well. 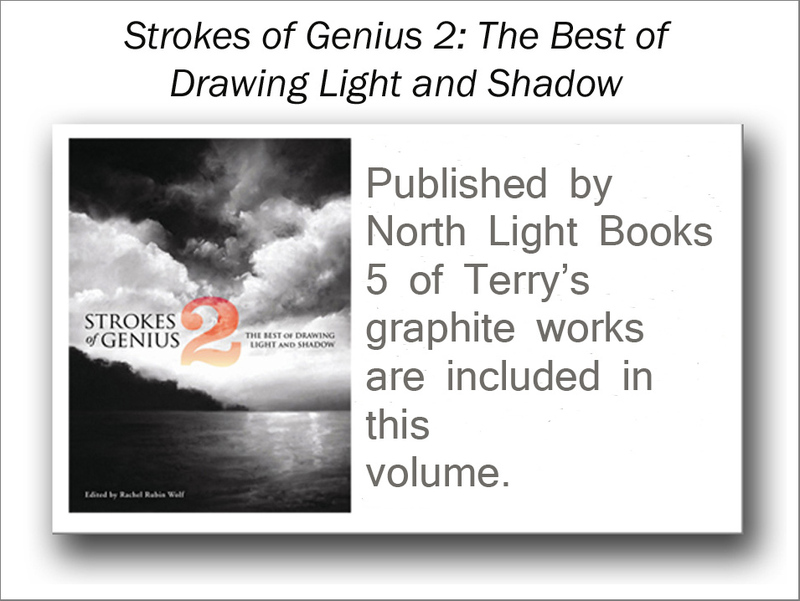 These next three works, the first by Arizonan Lynn Waltke, the second by Karl Taylor of Great Britain and the third by Joe Garcia of California all possess a strong vertical compositional idea and all three artists have positioned their main subjects in similar placement to the overall field. Waltke's 'Safe Haven' sits her house finch on the spiny perch of an agave; we know this from the accompanying text about the work and ultimately, after immersion in the work itself. 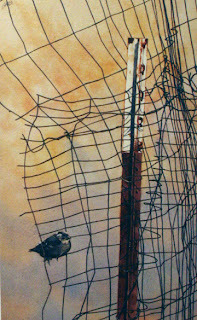 But my initial reaction to the oil, which was only 14" x 11", was total enjoyment in the absolute abstraction of light and dark, sharp and soft, distinct and subtle and the way all the forms and shapes seemed to just suddenly materialize out of geometric elements bringing the little bird to life amid the complimentary greens of the background, which in shape and form could be almost anything upon first, quick glance. I particularly enjoy works such as this where my immediate response is only to color and shape and light and dark, all key elements in the balancing of an abstract image. 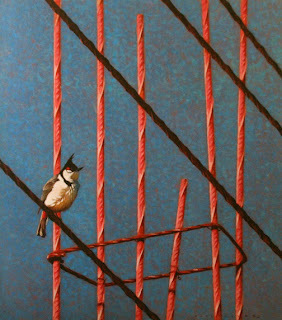 In Taylor's more squarish 18" x 16" 'Bulbul on Rebar', his graphic depiction of the key elements of his composition really pulled me into the painting, moved me around the work and the strong color contrasts again, as in Waltke's work, define the subject in a very minimalist manner allowing the bird to materialize out of the very abstract nature of the bar elements and negative blue of the sky. 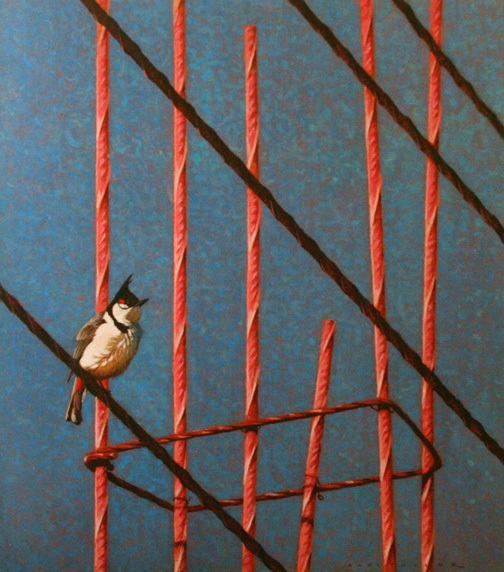 'Hold on and Hang Tight' by Joe Garcia rounds out this little grouping of three and he too, as Taylor has done, gives us a spare setting of wire and fence post against a soft and rather nondescript background, allowing the bird to hold our attention as it should. Less intense in coloration, the work still has impact because of his adept handling of the bent wires and jumbled tangle that simply balances the soft texture of the bird's feathers. And speaking of tangles . . . Californian, Shawn Gould's 'Chihuly's Garden' tickles the senses as the goldfinch is finally discovered after our eye travels around the intense splashes of color that is the bramble of blackberry. 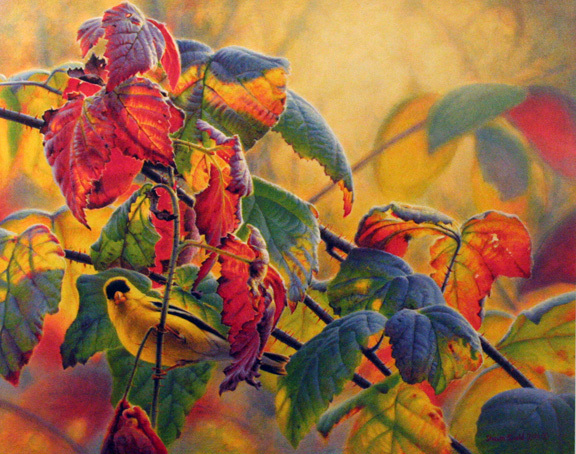 The sunlit leaves are a riot of color, nicely handled, beautifully rendered and trails the eye through the work toward the major subject. 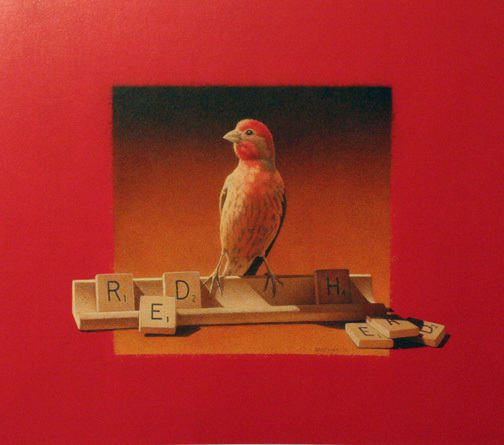 And even though the palette in this work is far more intense than in the previous three more subtle compositions, the bird sits in almost the same position as in Waltke's, Taylor's and Garcia's. Can this be a coincidence? I think not. I've often talked about the more challenging factors involved in composing within a square and Paula Waterman's 'Offering' is a very fine example of just how nicely a composition can be developed within that shape. 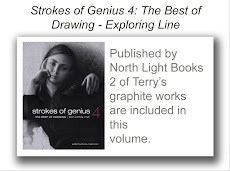 I've also spoken about the general 'rule of thirds' and how placing a prime subject on the points of the intersecting lines of horizontal and vertical third splits can be a most pleasing position for a main subject or the point at which you wish the viewer's eye to enter the work. Well, the intersecting beaks of the two birds just about land on one of the four 'sweat spots' in Paula's lovely oil rendering of blue heron. Chance? Doubtful. The idea that the upper bird's wings disappear off the canvas and the body of the lower bird's does as well, detract little from the intense pose of both and the strength of a well thought out placement of her subjects. 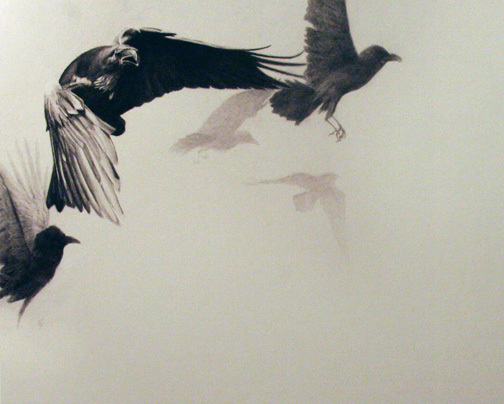 In Californian Ray Brown's marvelous 'Exodus', a beautifully drawn group of ravens darts into the field of vision, from where . . . who knows? The caring is not about from where these birds have come but in the utter exuberance of their gesture and movement into the open space they invade. As in Paula's work, wings vanish off the margins and one lone featured bird, so nicely defined and rendered we can almost hear the great flap of its wings, holds the focus and keeps our eye from leaving the work. 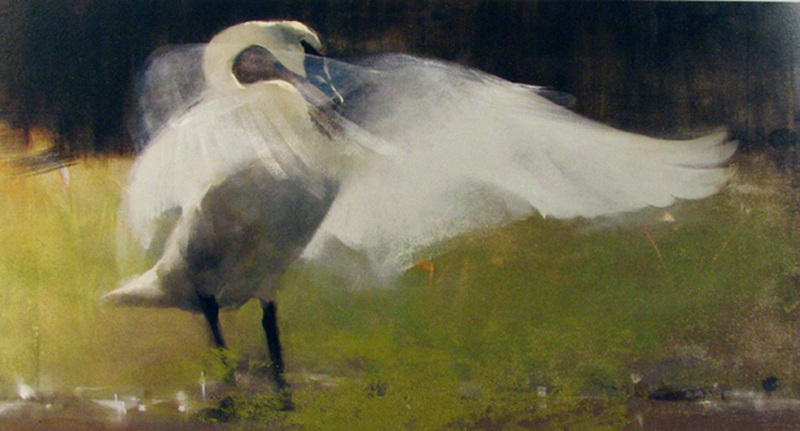 The background birds, as we study the piece and become more and more immersed in it, distance themselves and become almost abstract and subtle shapes that we know are there but only serve to reinforce the primary focus on the foreground bird. 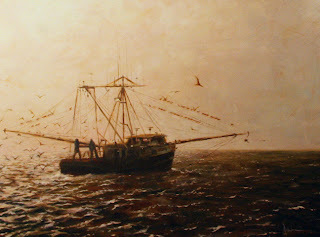 In the next two works, with water and boats as their theme, Connecticut resident, Sean Murtha and North Carolinian, Ralph Grady James deftly bring great mood and emotion into their oil paintings. In James's 'Trawling with the Gulls', which the museum has just acquired for their permanent collection (feather for you, Ralph! ), the birds are very secondary features in this lovely rendering of light and the sea. 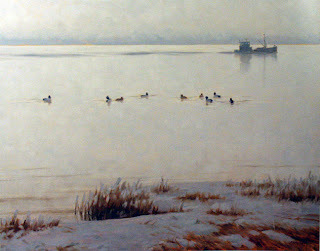 We all know what it is like to see gulls clustering about fishing boats at work, circling and darting in to pick up a snack if they can and Mr. James has truly captured that rather common event and given it a larger scope in which light sparkles on the water and intense late afternoon sun fill the work with great emotion. As I have said many times before to artists who ask, 'Does the bird have to be large for a Birds in Art submission?' I think this selection by this year's jurors answers that quite well. 'Goldeneyes on a Silver Morning' by Mr. Murtha, above, captures another evocative moment of the day. More subtle and softer than Mr. James's radiant sky, Murtha's more monochromatic scene made me pause in the gallery to, as they say 'set a spell' and allow time to get lost in the work, feel the soft air that barely moves the grasses, hear the soft chug, chug of the passing boat, listen for the gentle sound of ripples as the birds lazily circle in the water. There's not an awful lot going on in this work but the feel of it grabbed hold of me and I could not stop coming back to it. It is the sort of work that, if hanging on my wall at home, I would never tire of. The jurors certainly picked a winner with this painting as did the museum, which has decided to make this painting a part of the permanent collection. Spaniard, Juan Varela Simo's oil, 'West Wind' also grabbed my attention as I came up to it in the galleries. As in Murtha's work previous, I also stood before this lovely beach scene and felt the wind on my cheek and the soft spray of sand grains as they blew up. I really connected with this work as the composition certainly was one after my own heart. All the elements were perfectly placed, beautifully rendered and allowed me to immerse myself into its world for a time. A good work of art should do just that, let us get lost in it and find much to jog memory or aid recall of experience. I certainly could see myself walking the beaches of southern New Jersey or Chincoteague Island standing before this one. These last five works are the ones that rose to the very top of my list; the pieces that I had such strong feelings for that I kept coming back to them time and time again during the two days at the museum, never failing to find something more of an attachment to each. I am not listing them in any specific order as I could not, if given the task, say which would be my number one or which would be my number five. As far as I was concerned, all five would have been in a dead tie for 'first place' if I had to choose. So here they are . . . 'Where Feathers Come From' by first timer, Chris Maynard; 'As with Breath' by Wyoming artist, Kathryn Mapes Turner; 'Square Dance' by Ohioan, Mark Eberhard; 'Very Small Duck' by Seattle resident, Suellen Ross; and last but by no means least, 'The Final Embrace' by Ajay Brainard. 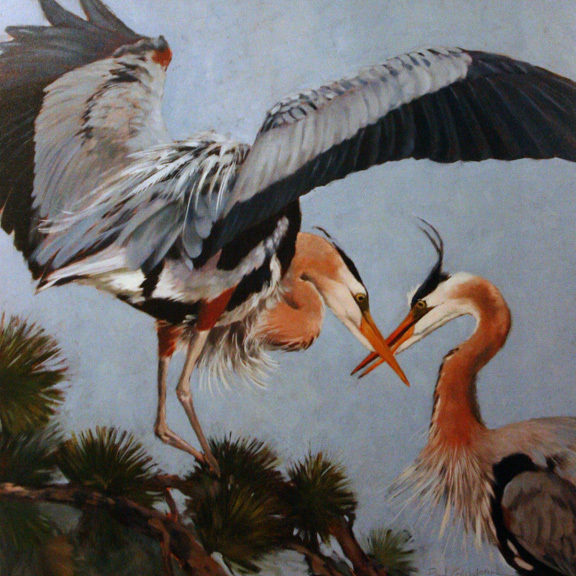 As I have noted before when I have talked about being at the opening of Birds in Art, I am amazed each and every time that a work or two, or four works or a dozen works, jump out at me and demand that I be almost breathless for a moment as I marvel at the inventiveness or uniqueness of the work before me. Chris Maynard's cut turkey feather, above, was a stunning example of the sort of work that will stop me dead in my tracks. 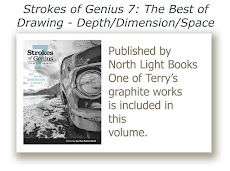 From the response of many of the other 73 attending artists, I was not alone in my amazement at the ingenuity of his idea to do what he did and not only to do it but to do it with such fine and emotive results. 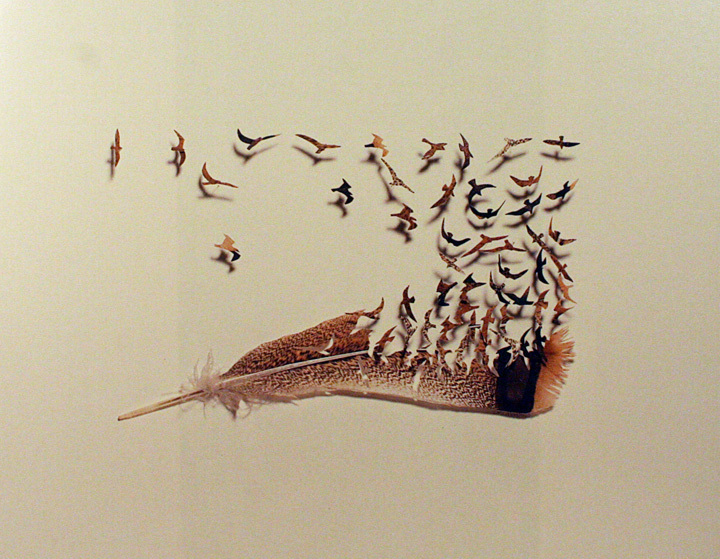 It is hard to tell from a flat photo of the work, but the feather has been cut into small bird-like segments and suspended in space by small pins attached to the backing board upon which the feather hangs. 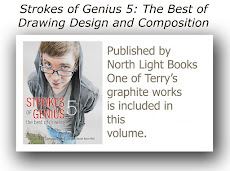 Simple, clean, unique in design, it is completely understandable why this work was chosen for the final cut by the jury. Kathryn Mapes Turner's work made it to my top five list two years ago and she certainly did it once again this year with this stunning oil. The simplicity of the brush work and the softness of the overall pallet gave this work a true feel of spontaneity yet it was pretty obvious that it was all very well thought out before putting paint to canvas. I believe it is rather hard to end up with a superb result like this if you just splash it on. I particularly was taken with the ever so subtle over-layering of the white wing color across the bird's head and neck. What I would have given to have been a fly on the wall of her studio at the time she stood before her canvas with this result. Mark Eberhard is a friend, but that does not keep me from singling out this work from his larger, wonderful body of work, several of which I have in my personal collection. With this beautiful and very emotive monochrome oil, I believe he certainly hit one out of the park. Again, the inventiveness is not totally new, others have attempted this sort of semblance of many individual components into a larger unit, but Mark's capable hand and brush do the format superb justice. 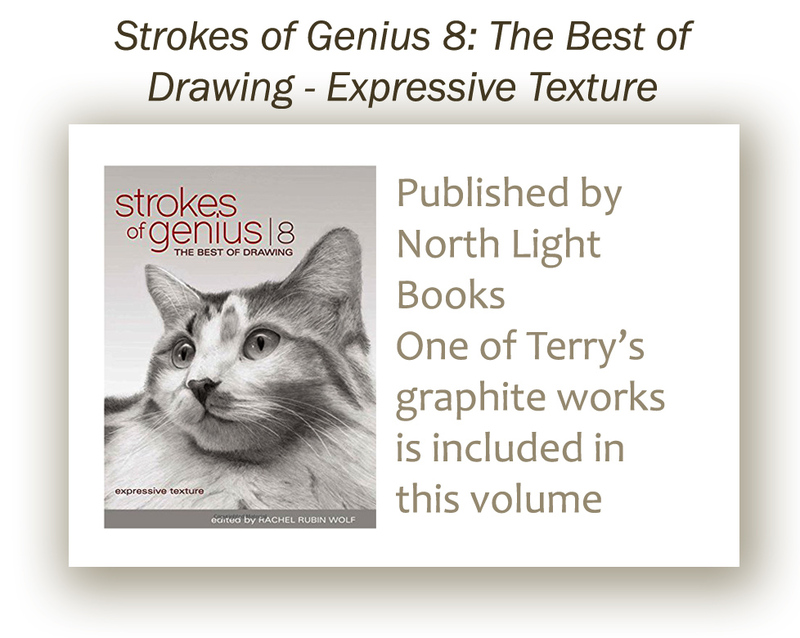 He not only is a master at rendering the bird form, a particular favorite of his, but he does it in a way that really makes the subject a graphic representation of more than just feathers and beaks. 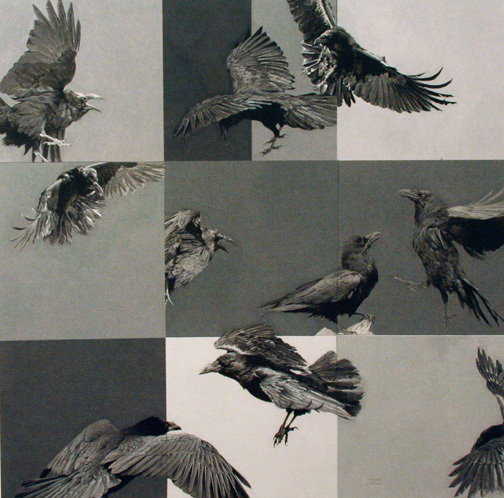 His birds are pieces of the larger puzzle of compositional elements that he meticulously combines into what I call representational abstractions! Of course I was drawn to this work because of its monochromatic presentation at first, but quickly got lost in the more important aspects of the piece and how he captured the unique nature of this particular species. No need to bother about disappearing wings and birds 'falling off' the margins of the work. It is an entirely well balanced unit, all elements depending upon each other, interacting with each other and nothing left to chance. I have admired Suellen Ross's work for many years and her juried work this year continues to remind me of what it is about her work that I find so engrossing . 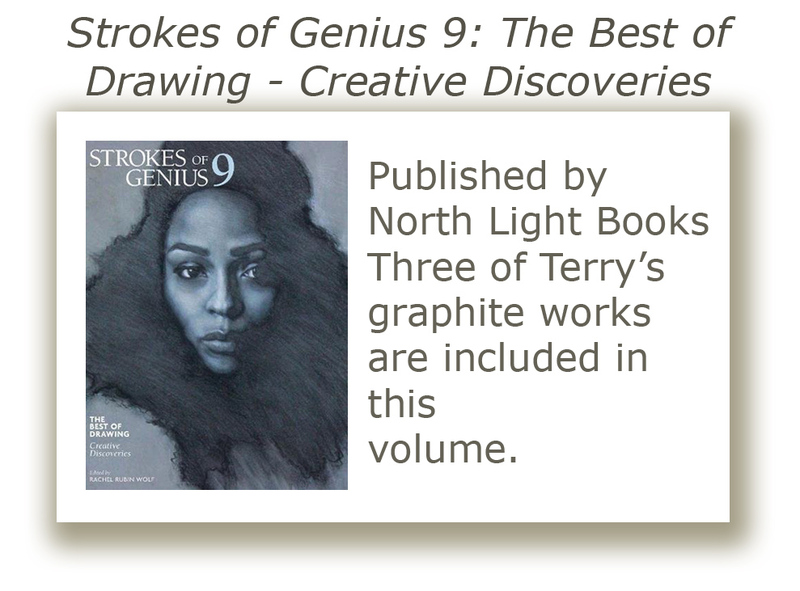 . . the beauty of her compositional ideas juxtaposed with her stunning abilities with mixed media works. India Ink, Watercolor and Colored Pencil are the physical components of this particular work, but they only serve to render her simple yet entrancing composition. 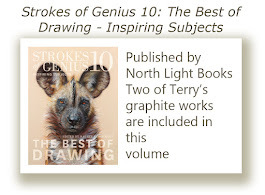 Having recently done a small drawing of a duckling swimming, I am keenly aware of the thought process involved in coming up with an interesting idea to showcase a rather simple subject. 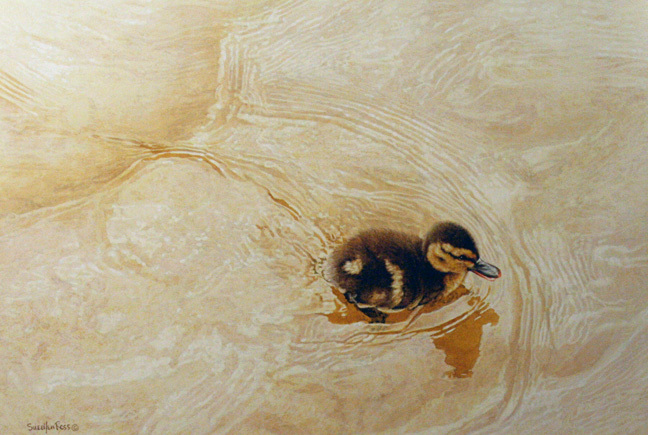 Suellen's true genius is in using a very spare color pallet, the water really echoing the undertones of the duckling and in so doing, enhancing its offset position in the compositional field. As in many of the other works spotlighted above, her duckling rests quite close to the intersecting points of the rule of thirds yet again. She has masterfully rendered the water and its swirling ripples yet they do not detract from the importance of the subject. Finally, Ajay Brainard's compelling large canvas (20" x 40"), stark in its content, emotive in its story, just blew me and many others way far away, I'm still looking for my socks! Beyond the emotionality of a dead creature, his touching placement of the bird across the sculptural screw not only juxtaposes interesting textural content but forces one to try to decipher the artist's intent. It is a depiction that will shock some, surprise others and bewilder even more. But, in the end, it is a flawless work of art in my estimation, well deserving of the juror's selection and one that, now, the Woodson Art Museum will be adding to its permanent collection. I cannot imagine a more fitting representation of what 'Birds in Art' is and should be all about . . . the representation of the finest of what fine art is, incorporating the bird as a major or minor feature. The only thing left to say is that I have my work cut out for me now . . . preparing ideas for next year's submissions! I'm not alone in that task. Done. Image is 6.25" x 7.8"